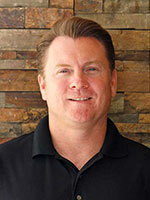 is a Partner and Clinical Director for the Palmdale Vargo PT clinic. He has been a licensed Physical Therapist since 1999 and is also a certified athletic trainer (ATC) and ASTYM Certified Clinician. In addition to managing the clinic, he evaluates and treats outpatient orthopedic, sports rehabilitation, shoulder rehabilitation, elbow rehabilitation, worker’s compensation and personal injury patients. Priding himself on personally investing in every patient he meets, Mr. Johnson works to create individualized plans taking into account all of each patient’s unique factors. He believes physical contact -- joint/soft tissue mobilization, therapeutic massage and other manual treatments such as PNF techniques and gait/balance training -- are essential to rehabilitative therapy. Mr. Johnson holds a bachelor’s degree in sports medicine/athletic training with a minor in exercise science from Barry University. He received his master’s degree in physical therapy from Nova Southeastern University. While attending physical therapy school, he worked as a medical assistant/athletic trainer for the orthopedic surgeon and team doctors for the Miami Dolphins and Florida Marlins. Prior to joining Vargo PT, Mr. Johnson was a supervisor at an outpatient physical therapy clinic in Los Angeles. Before that, he worked as a physical therapist and athletic trainer at Healthsouth Doctor’s Hospital in Florida. Mr. Johnson lives with his wife and two children. In his free time he enjoys fishing and all sports, including coaching his kids’ sports teams.